2012 has been an awesome year! Is it true the number 12 is the number of completion? Well I sure felt it has been. Our Red Sea Ohana would like to extend our biggest mahalo to all of your support, friendships, and love to making dreams come true! We got some great waves, good fish, and more importantly lots of new friendships made through Red Sea Ocean Adventures. Christmas was super busy for us as always but we managed to get enough fish for the holidays so we decided to try out luck once again for the new year. The Red Sea Crew consisted of Kekoa, Cat, Me and the two old crows at the dock to assist the launch. My dad is offering trailer valet services for those interested. Just park and ride! $25 and you get your trailer washed, parked, and put in the water when you return. Ha ha! It was a mad house of boaters and by 6 am there were no parking at the ramp. We had the lucky "Ti-leaf" in position and made it out to my secret spot and I decided to do a quick look for onos with my small gun. Kekoa was driving, Cat was chumming, and I was looking. I saw two and dove down but the small gun didnʻt have the range I needed so quickly asked for my big gun. Next thing 2 more come in and this one was BIG! He gave me the look and I pulled the trigger and next thing my Lance Ohara float gets buried! I climb on the boat and we begin looking...It pops up tomb stoning and I jump back in to pull it up. I asked Kekoa for the small gun and go down and shoot it again then Kekoa gaffs it into the boat. It was my biggest ono (wahoo) to date clocking in at 50 lbs. 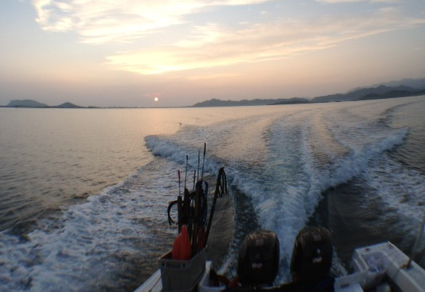 After a few more drifts the action disappears and we decide to head out for some trolling. I set out the lures and we find a bird pile on the way in and the line goes off. Kekoa pulls in a nice aku and the other 130 penn goes off. Its big, and the fight is dragging. As it comes up we see its a oceanic white tip shark on the line. It must have bit another fish we had on and got stuck on the hook. We cut the line and decide to call it a day. 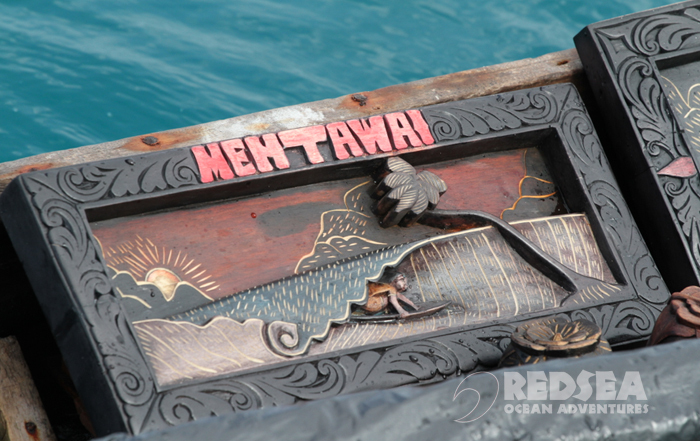 Thank you to my Red Sea Crew, Cat, Kekoa, and 2 old Crows for all your help. What a way to end 2012. A few months ago we finished up a video for Hawaiian Airlines Video Magazine. 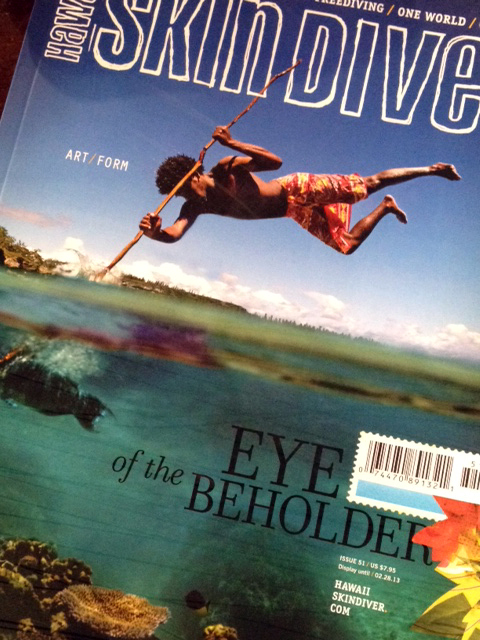 It was something totally different for them and we were excited to feature Hawaii Skin Diver TV on Hawaiian Skies. The show features Kimi Werner and her recent trip to the Northwest Hawaiian Islands with Randy Kosaki and researchers on board the NOAA ship Hiʻialakai. The episode can be seen on your next flight on board Hawaiian Airlines and will air till March 2013. The final presentation, spicy tuna dish is complete. Merry Christmas Everyone! Hope you all have a safe and fun holiday! 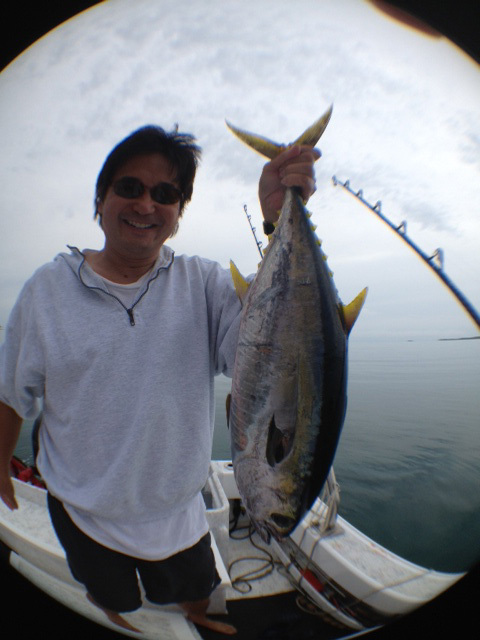 Yesterday I decided to head out for some fresh sashimi for our family Christmas party. 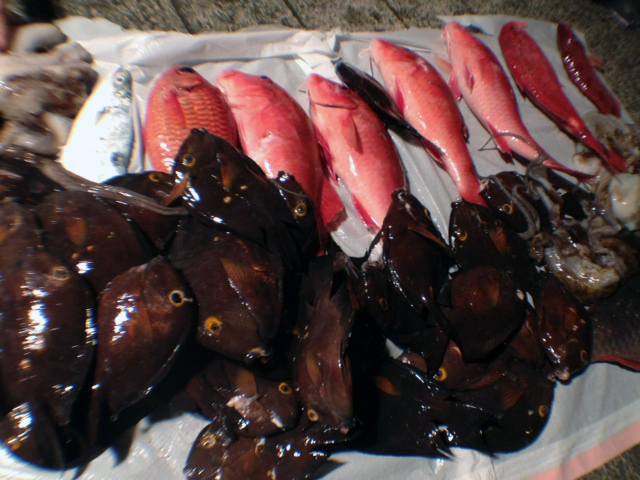 We are so blessed to be able to go out to the supermarket ocean and catch fish anytime. The water was nice and waves came down so it looked really good! We have a Christmas party to attend so the pressure was on. I brought out my favorite "Gaji" lures and sent out 4 lines. 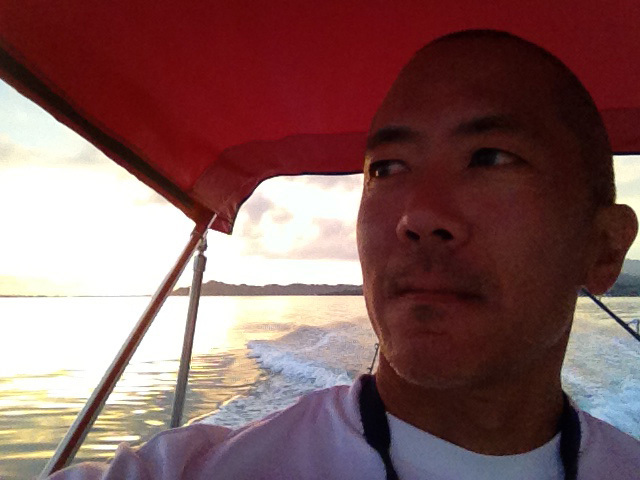 On board was my brother in law, Alan Kaneko who was my first mate as I manned the wheel. I felt like we were on one of the charter boats of the tv show, Wicked tuna. We trolled and jigged but no luck till after lunch when we saw a few boats in an area. Birds were around and then the action stirred! The water started to boil and birds started diving in front of us. Then all of a sudden all 4 lines go off! Screaming! Alan grabbed a pole while I put my bungie on auto pilot and kept the boat running forward. I started to help with another pole as Alan worked his fish up. I reel up my shibi first and ask Alan for the gaff. He is reeling his fish up, passing the gaff to me while I land the first one in the boat. Next comes up Alans fish then we reel up an Aku. One got off but 3 was taken. We bleed the fish and set the lines up again but no bites. The ride in was sweet. The pressure was off now. 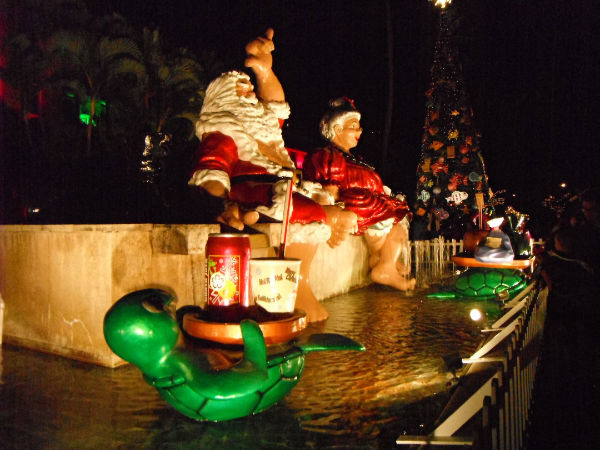 Pau help Santa deliver gifts so headed up to the north shore to catch a few waves! Was pleasantly surprised to see some overhead sets! Only had my 5'6" so had to make do. Also got to see some eastside boys Ross and Barney out in the lineup. Tomorrow should get bigger with 3x the crowd as the winds slowly taper off for the weekend. How's everyones Christmas shopping doing? Seems like I haven't touched water in such a long time. Fixing, cleaning, working has kept me busy during this windy spell with no waves. What's happening with next years Red Sea Ocean Adventures? 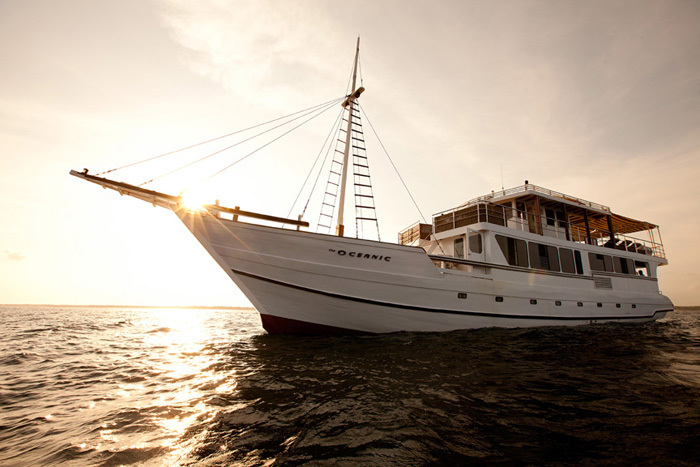 Well my friend from Indonesia contacted me and wants to take us on his luxury boat to another dream destination. There are couple options I am thinking of going to but haven't decided yet. Either way it will be by far one of the nicest boats yet. Check out this dining room inside the boat. I can only fit 10 people so once I decide the dates and exact destination be ready to sign up! It probably be somewhere remote in Indonesia. Until then, time to start my deliveries as I see some light winds and waves ahead soon. 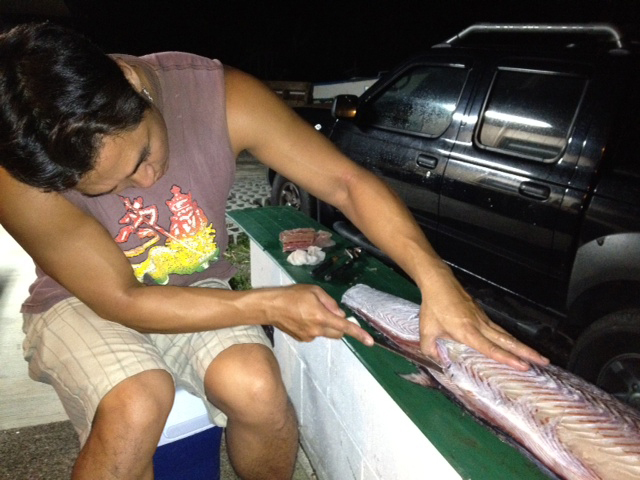 I want to eat fresh fish and get barreled again! Red Sea fish rack is finished! Now we got a rack to hang our catch and snap some photos! 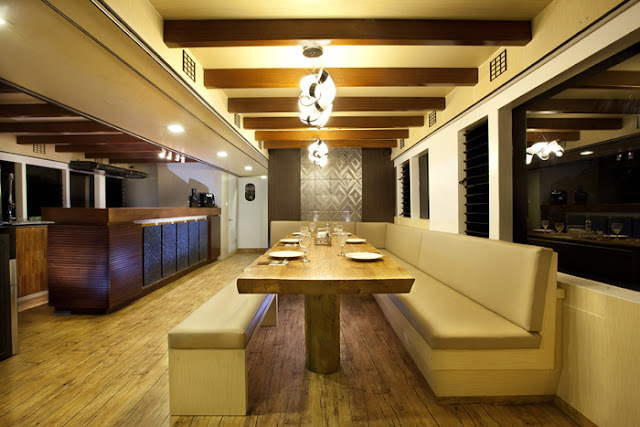 Can't wait to test it out on our next outing. 9 more days before christmas-) pressure is on! One of the best parts of traveling to other third world countries is giving and sharing things with the locals. Last year we had the opportunity to share some Go_Naminori donations to children in small villages in Indonesia. Donations of pens, paper, coloring books, etc were given to these villages impacted by the 2010 tsunami. This one kid, Angiel is very special and I've seen him grow up since he was a little kid. He would come out on the canoe with his dad and they would sell wood carvings to us. Today he must be about 11 and still comes out and sells things to us and also surfs super good. As we gave him his supplies his friends in the back made fun laughing at him as if he was a little kid. But he gracefully accepted our gifts and smiled. These kids live a simple life and have no worries. 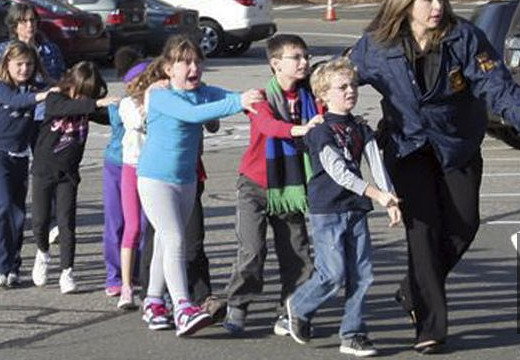 In contrast I saw the news of the horrific tragedy in the elementary school in Connecticut. Who would have known this was going to happen where so many innocent children would die. Our thoughts and prayers goes out to all those families who have suffered such loss. I wonder why kids in the USA have such a complicated life as compared with those in the local village in Indonesia. They are bombarded with the evils of our day as portrayed in video games, television, and killers with no conscious. 9/11, columbine, now connecticut, what's next? Winter weather is here in Hawaii! Cold, windy, rain but probably nothing compared to our friends around the world. Tomorrow the Pipe masters supposed to finish but not sure just how good the waves will be for the final. Will it be Slater or Parko? We will find out. Twelve more days before Christmas and Mr. and Mrs Claus was seen cruzin in town (photo by Al Ah Nee). I think I better start my shopping. 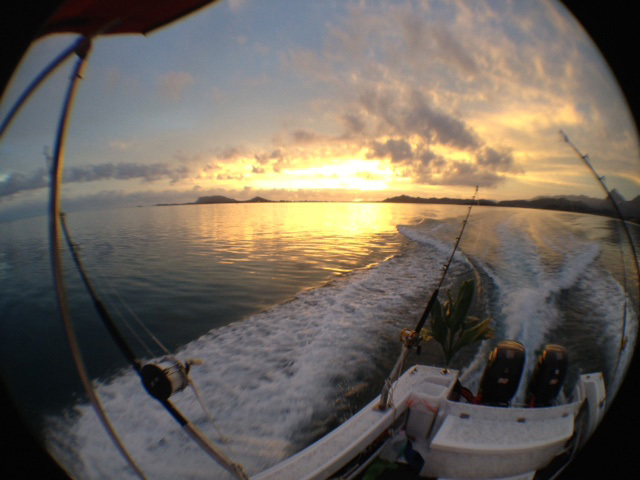 Today was another nice day in paradise so our plan was to go fishing. 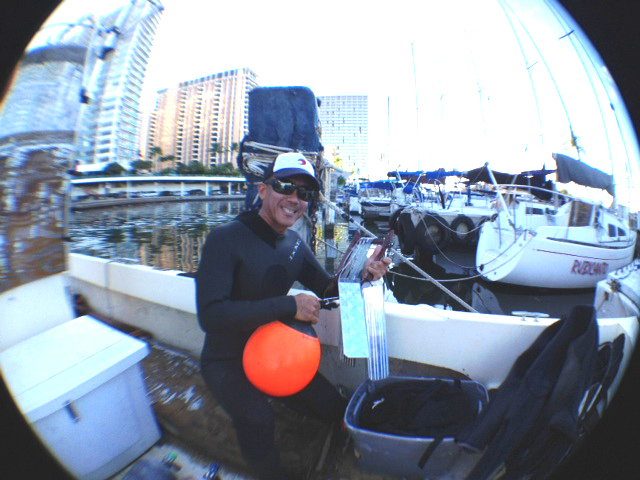 Kekoa Mau, James Oshiro and I loaded up and were at the dock bright and early. We headed east and got to the buoy and saw several boats there already. They weren't trollling but jigging so we decided to test out our jigging skills. On our second drop, Hanapaa! 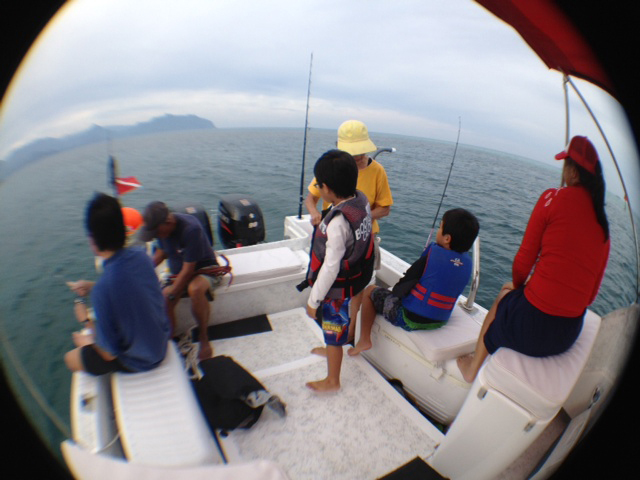 We hook up to this nice shibi and all the other boats pull up along side to watch us fight this fish up. We land it, bleed it, and snap a photo before we try again. After that we did a few more drops and move inside to find this nice mahi mahi and luckily snagged it in the eye with our favorite gaji lure! 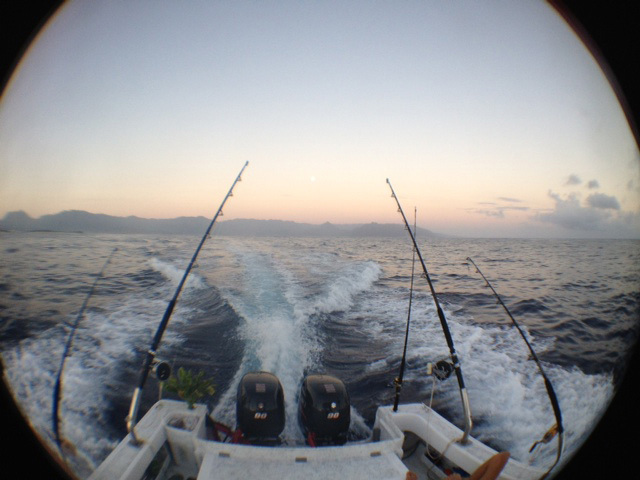 We boated the fish and set the lines out and my outrigger with the 12/0 reel goes off! I put the boat in gear but the hook doesn't set in time.. I wonder what kind of fish we lost. 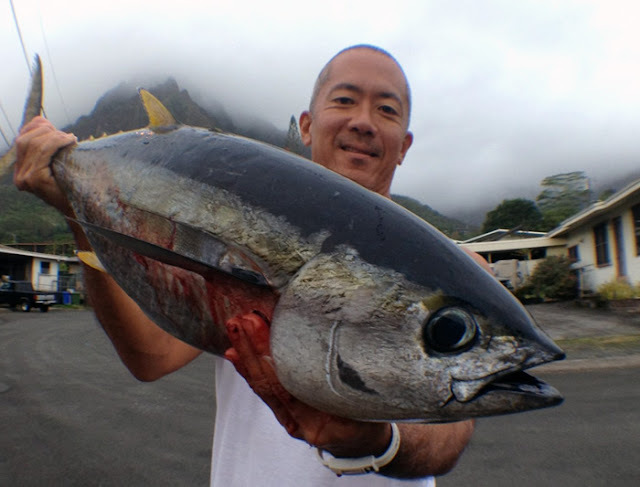 Next time we will get the 100+ lb ahi. Thanks Koa and James for a fun day on the water. 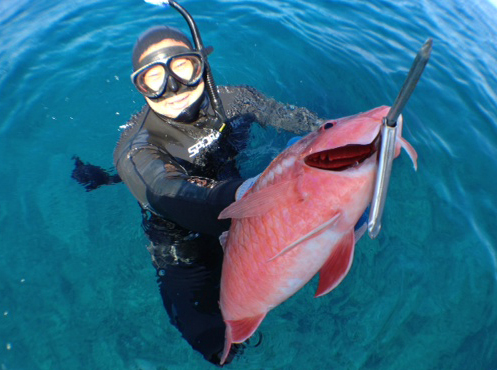 This is the female red parrotfish also known as "uhu". Local diver Aaron got a good shot on this 12 lb. uhu and it was his personal best uhu so far. 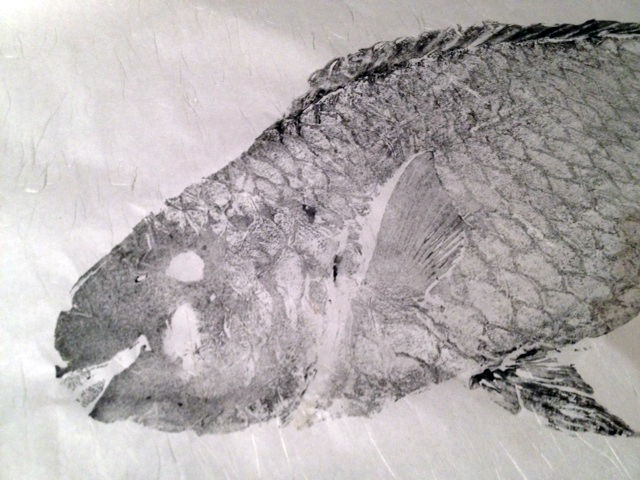 So he called us up and wanted to get a print of his fish. It came out great and you can even see his shot on the cheek of the fish. And the other goat fish we caught the other day, well this is the final product. 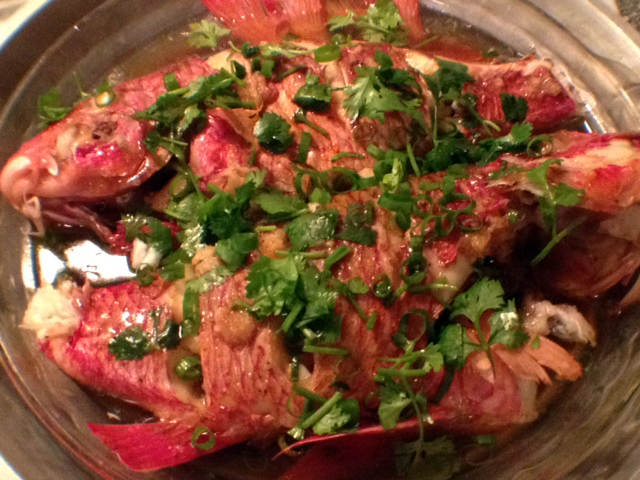 Steamed goat fish made chinese style is winners! 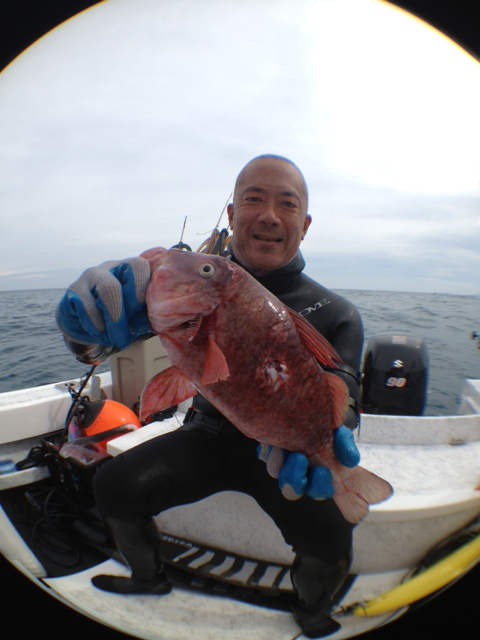 Todays weather was wierd so last minute this morning we decided to head eastside for a quick dive/fish. Winds were smoking SE but at least it did not rain as they forecasted. On board was Alan, Kirby, and Cathy. We brought all the tools but only used a few and didn't troll because it was rough. 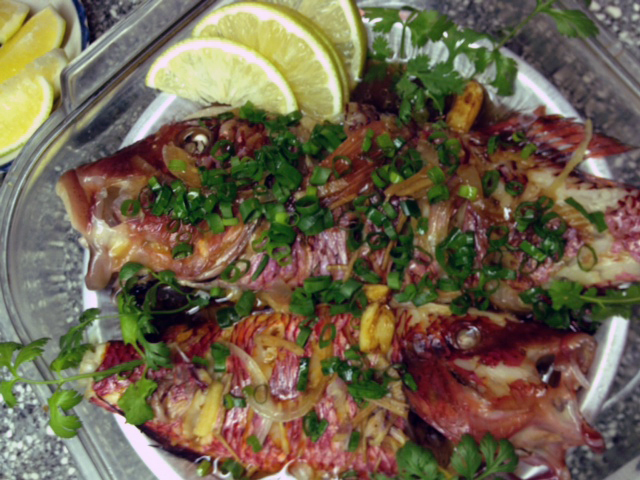 On the menu today was Jo Louis, a tasty goatfish. He just so happened to swim in front of my spear when the trigger got pulled. 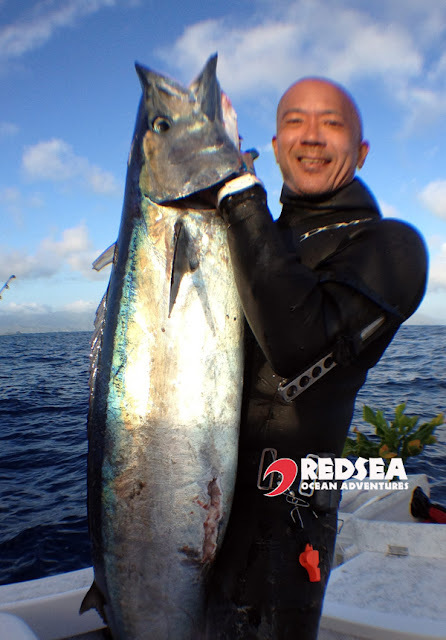 Bite was slow so Maika took the wheel of the Red Sea boat and figured out how to read my GPS and put himself on the spot to catch this world record veke. How cool is that? It was great to have my whole family on board the Red Sea boat and we look forward to many more adventures together in the future! Mokuleia dawn surf check little wild and wooly so I opted to surf laniakea with 50 other guys! Fun 5-7 ft. but crowded. I think I'm spoiled...from indo! With this great weather I think I may have the solution to what to do, surf or dive? Why not do both? So I rigged this longboard up and ready to rock and roll. I can pull up to any beach and draw a straight line to my secret spot and not worry about anything except having fun in the sun. Catch waves then catch fish. The winds are looking light and variable so you know what that means! I wanted to test out my new flashers I made so jumped on my friends friends boat and off we went for a quick dive today. These flashers are for pelagic fish and costs anywhere from $60-100 in stores so I made my own and save some money for my next trip. 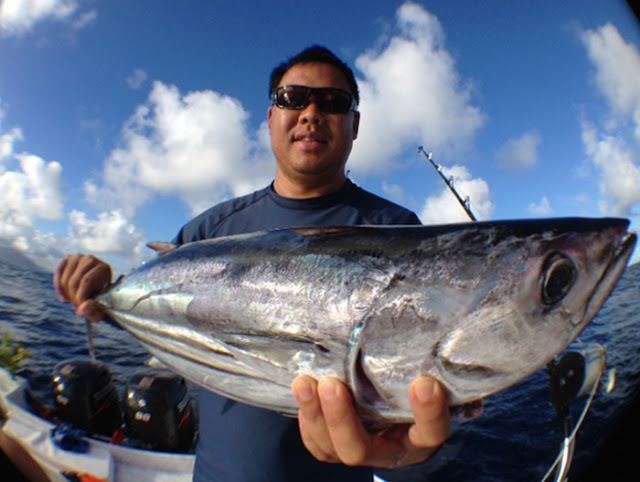 Brent, John, Kekoa and I went out for ono check but no luck! Water was super nice and it was so refreshing to get in. Flashers worked great and guarantee will catch next time we got more time to spend diving. 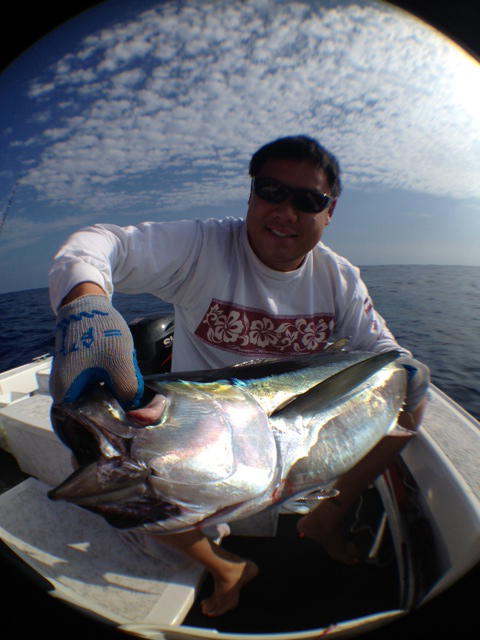 My friend Travis been getting lucky and sent me this nice pic of a ono he landed weighing in 47 lbs. in rough seas. Congrats Trav on another nice fish! 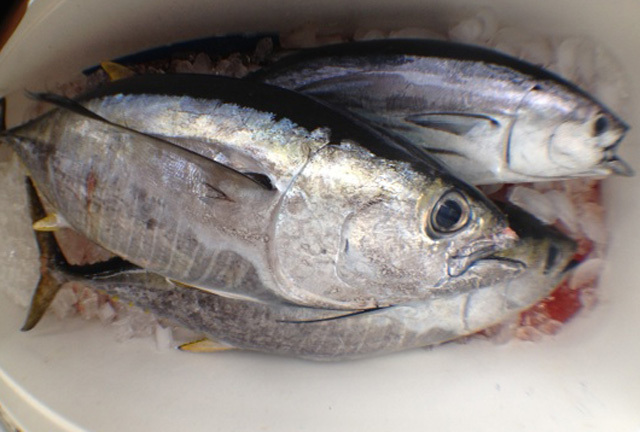 And mahalos for the slab of sashimi too! Dat buggah was winnahs! Winds should be light all week and some nice waves coming too. What to do? HSD Mag issue 51 just out on Newstands! 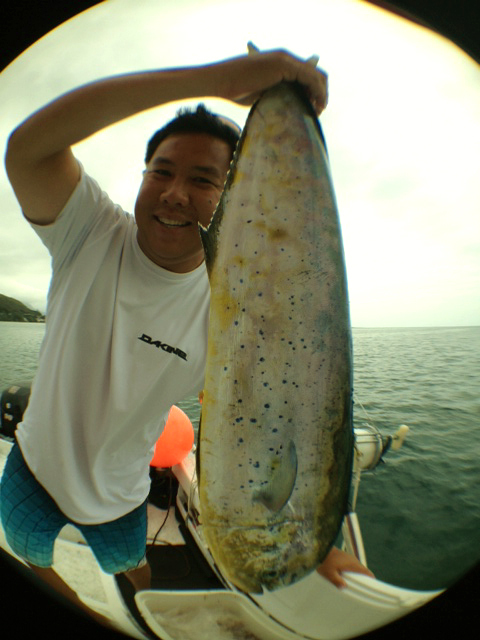 Check out last years trip to Punta Mita where Jonathan Muratsuka spears his biggest fish of his life! 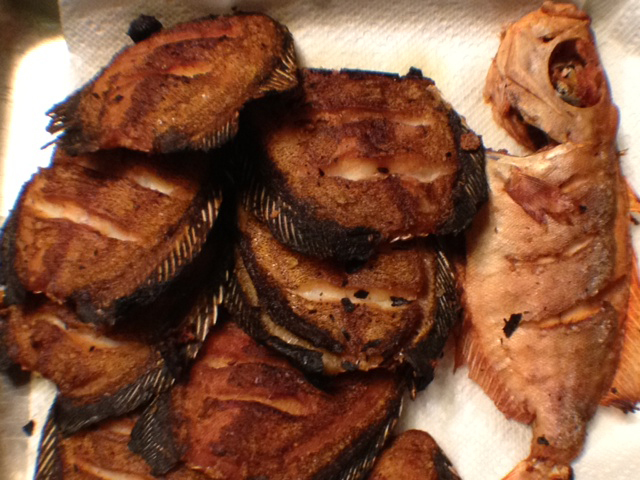 And those little black fish with orange eye was fried perfectly for our dinner! My friend likes these so much that he even makes Kole sandwich. Yup he put them between 2 slices of bread and grinds um. The fish on the right is the Aweoweo which is also hard to find nowdays. Final main dish is steamed Kumu, fit for a king! These were so delicious! 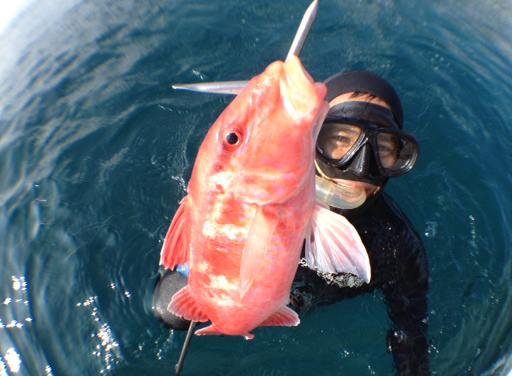 Also known as white saddle goat fish, they vary from 2-4 lbs and sometimes even bigger. Hope everyone had a Happy Thanksgiving holiday! We had so much food that I probably gained 5 lbs. Weather was nice and water was flat today so diving was the call. We had the onos for Kumu and Kole so reef diving was the plan for today. 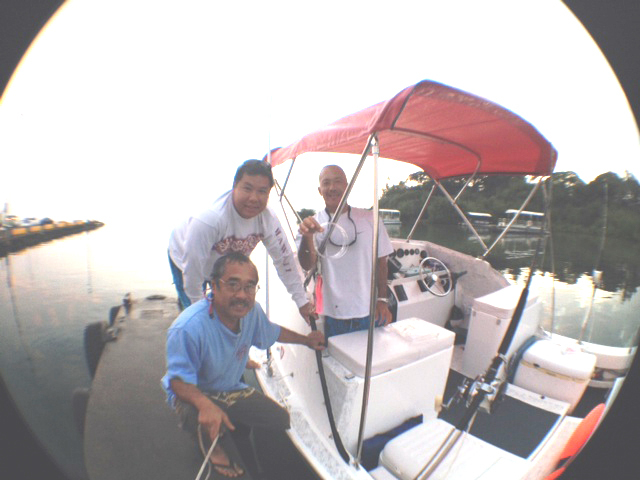 Kekoa Mau and Keith Yamane boarded the Red Sea boat and we were off bright and early to see the sunrise. 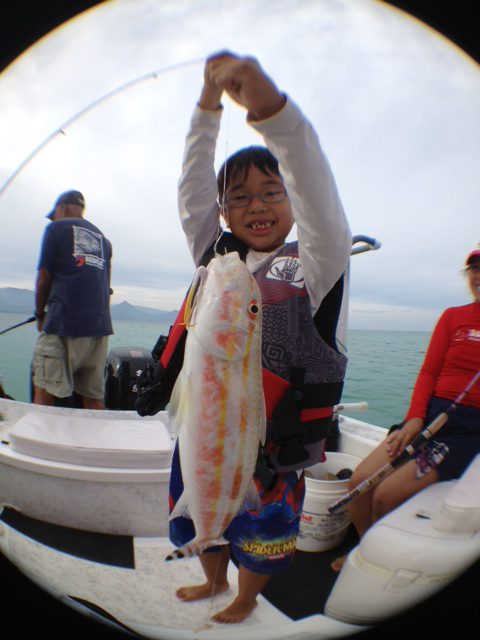 Kekoa got a nice Kumu and his smile said it all! 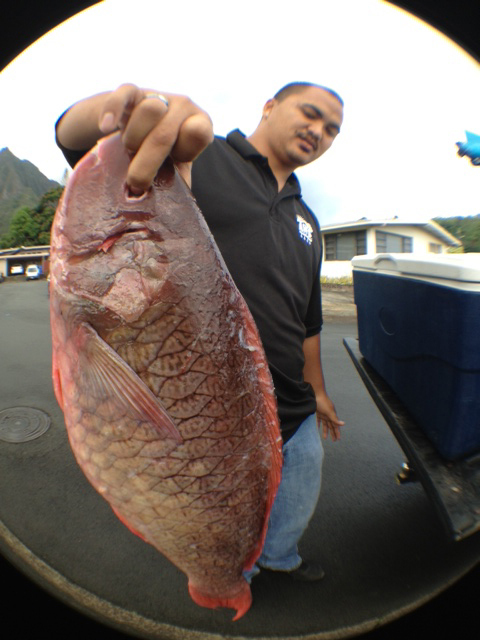 This prized reef fish goes for $14/lb here in Hawaii and anybody who gets one is super happy. 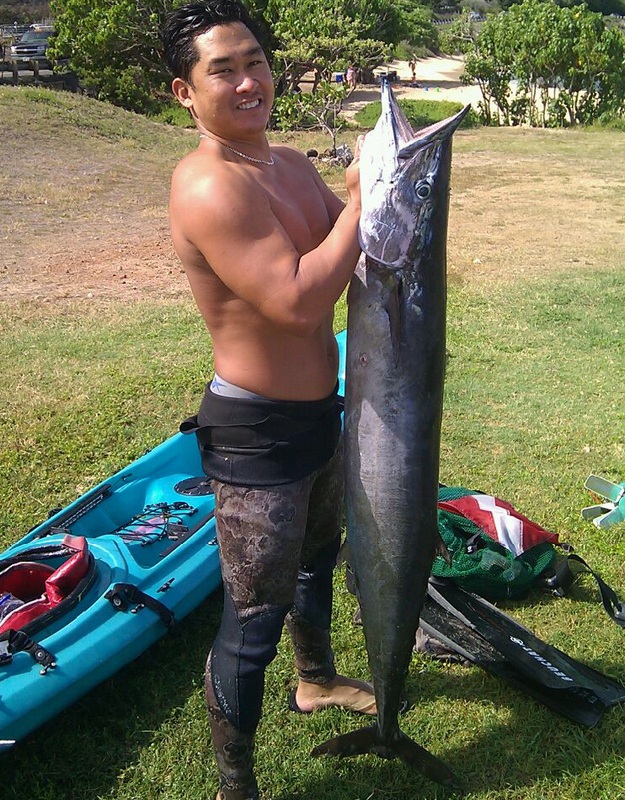 Keith Yamane also got this nice Kumu at one of my secret spots and was also a happy camper. Giovanni's shrimp $13 plate. Pupu hour starts now! Finally got out of the house with hopes of timing the arrival of the next north swell and help with my jet lag. Decided to surf a short paddle wave that was hollow and fast like Ht's. V-land was the call. This spot is heavy localized spot and this is where you park your car and walk about 10 minutes before you paddle out. Today only had 15 guys out so I was able to get my share of waves. Then the groms came out and I went in. Waves should hold tomorrow and drop on Friday so gotta get the dive gear ready! After returning from Indonesia, there was one dish that everyone remembers. Kekoa "Paduan" Mau entitled this "Lady Killer" shrimp dish that our cook made 2x for us. This may just be the dish to make for the upcoming thanksgiving party. Only problem is only Kekoa knows the secret recipe. Mentawai 2012 Trip will go down in history as the most uncrowded Mentawai trip ever! 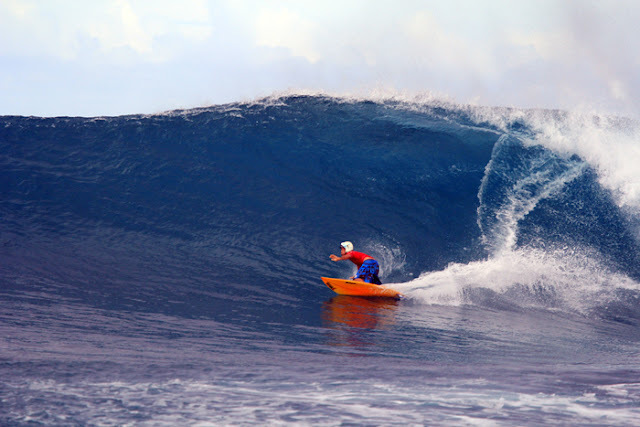 We scored every spot with great waves and only a few boats to be seen all throughout the Mentawai islands. Every time we pulled up to a spot we were all so happy to surf our dream waves all alone. Lena Ching above was carving her way to the top on every wave! Cecile Kim also took her surfing to another level, charging waves way overhead and giving her 110%. Al Ah Nee loved every minute and got shacked. Kekoa Mau also loved his lefts and seen here dropping in on a bomb at lances left. David Patterson got his barrel of the trip at HT's and will remember this wave for the rest of his life! Mentawai continues to be one of the best spots for surf travel. You can find perfect waves and if you time it right you may be able to surf it all alone like this group did. Thanks to all awesome group of surfers/divers for joining us on this amazing adventure!